During my Career Options after BDS article, I had promised to write a detailed guide on How to Work as a Dentist in Canada and How to work as a dentist in New Zealand for foreign accredited and non-accredited graduates. Both are fabulous for dentists to earn and settle. Both are beautiful, developed and economically stable countries which are fit for dentists from all over the world. In this post, I will give you a basic idea of how to work in Canada as a foreign dentist. Of all the dental job opportunities over the world, many of my readers are interested in migrating to Canada and settling there as a dentist. And they are not wrong about their decision and I have few reasons to say so. The sole purpose I am writing this guide on How to Work in Canada as a Foreign Dentist is to give you an idea about the procedures to follow to register as a dentist in Canada and work there. With this guide, I aim to help you with procedures and steps to work in Canada as a dentist that will ultimately help you get you a bright dental career. Now, let’s take a dive! Dentistry is a regulated profession in Canada. To work as a licensed dentist in Canada you must have a BDS/DDS/DMD degree and must be certified by the NDEB. The full form of NDEB is National Dental Examining Board of Canada. There are different ways to get a license, to work as a dentist, in Canada. 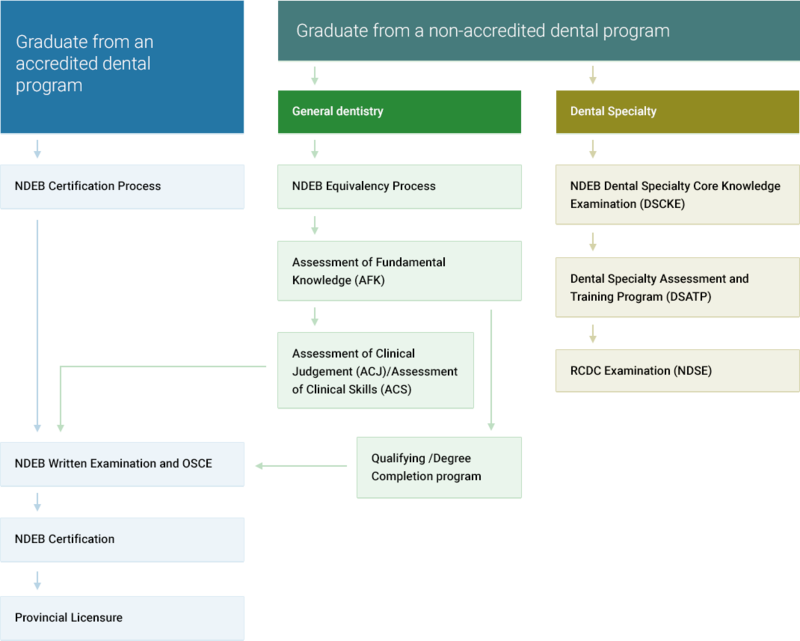 I am sharing a flow chart of the pathways to get a dentist license below, which is provided on the NDEB official website. As you can see in the picture above, there are two ways to get a license. One option is for Graduates from an Accredited Dental Program and the second option is for Graduates from a non-accredited dental program. You will be provided licensure only after NDEB certification. So now you might be thinking which all are the accredited dental programs, right? Below I had listed the accredited dental programs. Now I will tell you how to work in Canada as a licensed dentist if you are a graduate of the above accredited dental school. Who are Graduates of Non-accredited Dental Programs? Individuals who have an undergraduate dental degree from a university-based institution, which is not recognized by The Commission on Dental Accreditation of Canada are Graduates of Non-accredited dental programs. If you are a non-accredited graduate, then you can skip the below section and read about procedures for Graduates of non-accredited dental schools. If you want to work in Canada as a dentist, all graduates from the accredited dental program must clear the NDEB or National Dental Examining Board of Canada’s certification process. The candidates must give two examinations which are included in the certification process. 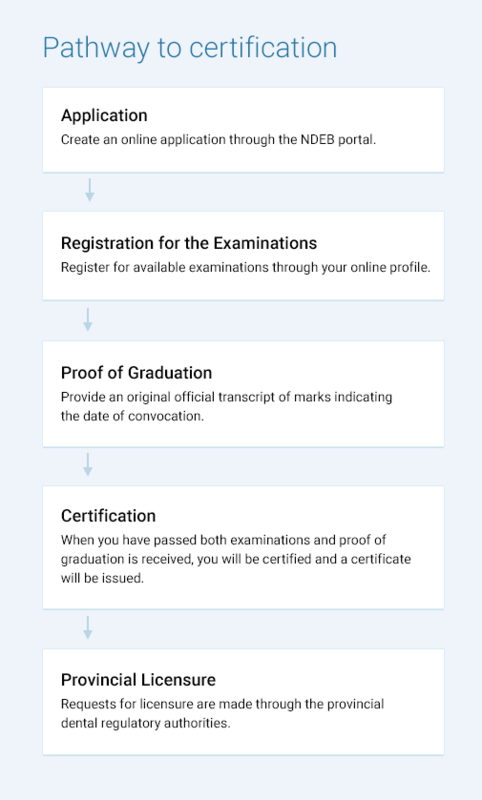 Just check the pathway of certification which is given below to get a brief idea of the procedures. I will tell you about each and single step of this procedure in detail. So continue reading friends. How to Apply for the certification process? Are you applying after 5 Years of your Graduation? If you had graduated from an accredited dental school more than 60 months ago? Then you must download this Special Consideration Form. It’s a simple one-page form which you must fill and attach some documents that are listed there. You can get the dates and location of the certification process on their official website. Written Examination Fees – $900.00. Written Examination Outside of North America – $1100.00. Objective Structured Clinical Examination – $900.00. Objective Structured Clinical Examination outside of North America – $1100.00. Withdrawal before the last date of Registration – $250.00/Examination. Withdrawal after the last date of registration – $450.00/Examination. Withdrawal within 14 days of examination or failure to attend examination – Full Fee/Examination. Written Examination Manual Rescore – $150.00. OSCE Manual rescore – $400.00. So friends, let me start with the basics because I had got hundreds of emails regarding How to Work in Canada as a Dentist for Graduates of Non-Accredited Dental Programs. Before reading further go through the flow chart given below. Completion of the NDEB Equivalency Process. So, now what is the Qualifying or Degree completion program? These programs are offered by faculties of dentistry in Canada. These are custom designed programs to make international graduates adapt to dentistry and dental practice in Canada. After completion of a Qualifying or Degree completion program, candidates are eligible to attend the NDEB Certification Process. And, What is the NDEB Equivalency Process? The NDEB Equivalency process comprises three assessments. After the successful completion of the NDEB Equivalency Process, you are eligible to go for NDEB certification process. Recent Photo in JPEG or PNG format. And a valid credit card or making the online payment. You can go through the following documents given in the NDEB Official site by selecting below. After registering and creating an online profile you must submit few documents. The instructions for Document Submission and Degree completion form will be available on the dashboard of your account. Think you are not able to submit the required documents due to situations out of your control, then you may use the NDEB Alternative Document Submission Process. All the documents you have provided during the application will be sent for verification by NDEB. The verification process may take as long as 12 weeks. The verification status of all your documents will be displayed on the dashboard of your online profile. When everything is verified you will receive a mail confirming that your application is approved and you will be able to register for Assessment of Fundamental Knowledge(AFK). All the details you want to know will be updated in your dashboard. If the application you submitted lacks any documents for verification, you will be notified via an email on what are the changes in that or what else to attach to the application. If the application is Incomplete then it will take an extra 12 weeks from the date they receive the correct documents. Please do review the application you are going to submit by keeping the guidelines in mind. Information about each document can be found in the Guidelines for Required Documents Section in your dashboard of the profile. Government-issued Identity card with photo. Name change proof, if applicable. Translation of name change proof, if applicable. Translation of Dental Degree or Diploma. Translation of Internship completion certificate. NDEB looks for the following things when reviewing a notarized document or translated document by a certified translator. Photocopies which are notarized should have original seal and signature of Notary Public or Commission of Oaths. The degree and other original documents should be photocopied and must have the original seal and signature of Notary Public or Commission of Oaths. The notary statement must clearly state that the document is a true copy of the original documents. The credentials of the individual must be clear on the Original seal, in English or French. If you are not able to get documents notarized by a local Notary Public or Commission of oaths, whose credentials are in English or French, then you may get it notarized by an Officer of Canadian Consulate or Canada Embassy. The translation must be done by a certified translator and should bear the original seal and signature of the certified translator. The certified translator must give the original seal and signature on every page of the document. The original seal must have the credential of the certified translator in English or French. A certified translator is an individual who has been evaluated by a translation authority and has a license issued by the government recognized translation association or council and have the right to do legal translations. The NDEB has developed an online self-assessment application for completing the Assessment Fundamental Knowledge. This web-based questionnaire consists of 100 multiple choice questions. After completion, you will be provided with a score and further guidelines. Now, the approved participants can register for the Assessment of Fundamental Knowledge through their online profile. The test is conducted by two books with each book containing 150 multiple choice questions. One book will be provided in a three-hour session, one in the morning and the other in the morning. A candidate can take three attempts of Assessment of Fundamental Knowledge. If the candidate scores 75 or more in the test, he/she can register for the Assessment of Clinical Skills and Assessment of Clinical Skills. The information provided is just an approximate percentage of marks to be distributed, which is given in the official NDEB Website. To sit for Assessment of Clinical Judgement you must have passed Assessment of Fundamental Knowledge. If you had passed AFK then you can log in to your profile and register for Assessment of Clinical Judgement. ACJ is a multiple choice assessment which consists of three books in a day. There will be a break between every book. Book 1 – The first two books are Books 1A and Books 1B, which is mainly about Diagnosis, Treatment Planning and Clinical Decision Making. This includes objective as well as subjective questions to find out your ability to diagnose and make clinical decisions. You will even be provided with case histories, dental charts, and photographs of different patients of different ages. Using radiographic prints there will be questions to evaluate your knowledge in oral radiology and to make a radiographic diagnosis. A register for Assessment of Clinical Skills you must pass the Assessment of Fundamental Knowledge. If you had passed AFK then you can log in your online profile and register for your assessment. The ACS is a two-day pre-planned clinical assessment during which you should perform a few dental procedures on dummies in a clinical setting. A typodont which will be mounted on a manikin. A list of few teeth for practice preparations. List of procedures with teeth number and surface. A participant communication form which can be used to pass comments about evaluators. To perform Rubber Dam Requirement you will get a scheduled time. Amalgam Preparation – Class II. Composite Resin Preparation – Class III. Preparation of Full Metal Crown. Preparation of Metal-Ceramic (porcelain fused to metal) crown. Access preparation on the molar tooth – Endodontic. Composite resin restoration on Class II pre-prepared tooth. Composite resin restoration on Class IV pre-prepared tooth. Amalgam restoration of a pre-prepared tooth – Class II. Provisional crown restoration for a pre-prepared metal-ceramic crown preparation on Day two of the assessment. The original unprepared tooth will be in the typodont used on Day one of the assessment. A pre-prepared tooth will be provided by them. Material Hygiene and Infection Control. If you passed the Assessment of Clinical Skills you are then eligible to give the Final Qualifying Exam which is the final step to work as a dentist in Canada. All your hard work will work well after you clear this final exam. Be ready to become a licensed dentist in Canada. Every dental graduate, let it be accredited or non-accredited they should give and pass the National Dental Examining Board of Canada’s written exams and Objective Structured Clinical Examination(OSCE) to work as a certified dentist in Canada. After you apply for the NDEB certification process, you should first go for the written examination. The Written examination includes two books, each with 150 multiple choice questions. You will get 150 minutes or 2.5 hours for each book. The exams will be conducted in the morning and afternoon on one day. Below I had listed an approximate of the number of questions from each chapter. These are listed on the official website of NDEB. OSCE comprises of two sessions of examination, one in the morning and other in the afternoon of the same day. It is a station type examination and you have five minutes to answer at each station. Two types of examinations will be there in OSCE. Each station will have two questions and the candidate should go throughout the information(case history, radiography, dental charts, photographs, casts etc) given and answer the extended type questions. Each extended type match questions will have 15 options and in that one or more can be the right answer. In some stations, you will have to prescribe medicines after reviewing the given information. You will get more details about the structure, format, and details in the below link. Examination centers will be provided to you one year in advance of the date of examination. In March examination, centers will be provided at each of the Canadian Faculties of Dentistry. In May and November, the centers will be established provided that there are at least 25 candidates at that location. If there are less than 25 candidates, then the center may be transferred to another location. Examinations will be conducted outside of Canada if there is a minimum of 50 candidates to appear for the examination. Application( Non-refundable One time fees) – $950. Assessment of Fundamental Knowledge(AFK) – $800.00. Assessment of Clinical Judgement (ACJ) – $1500.00. Assessment of Clinical Skills (ACS) – $5,500.00. Withdrawal before registration deadline – AFK and ACJ – $250.00. Withdrawal before registration deadline – ACS – $1500.00. Withdrawal after the registration deadline, but before 15 days of Assessment – 50% of Assessment Fees. Withdrawal 14 days before or failure to attend exam – Full assessment fees. Manual rescore – Assessment of Fundamental Knowledge – $150.00. Manual rescore – Assessment of Clinical Judgement – $400.00. Appeal – Assessment of Clinical Skills – $850.00. This article on how to work in Canada as a dentist is the resources I got online and I would recommend this to my friends if they are very good at English and clinical skills. My aim was to provide you with a simple guide on how to apply for a dentist license in Canada and help you have a great career in the future. Friends, this information is given here may change from time to time and I would suggest you stay updated on the NDEB official website. I will try my best to update this page according to the changes in their procedures. Are you looking for MDS admission? Read my exclusive guide on MDS admission through management quota here. Its quite informative about the courses in India and abroad. I would like to know whether dentistry has scope in India or not. Yes, BDS have a great in India if you move smartly. For pursuing dentistry abroad it is very costly. Hi. I graduated my BDS in Tamil nadu in 2011. Now settled in south Africa. It is very hard to get registered here as general dental practioner because the board does not very often conduct exams for foreign dentist. If I need to join MDS I need to have Permanent residence status and complete the community service which is hard to get started. I am willing to go for multidisciplinary courses that does not require board exam Clarence. Please can you provide me information’s on non clinical career that I can opt through BDS.